Image Credit: J.P. Grygny, "Orientation Day"
The Ainu say that the deer, salmon and bear like our music and are fascinated by our languages. So we sing to the fish or the game, speak words to them, say grace. Periodically we dance for them. A song for your supper: performance is currency in the deep world’s gift economy. While others, weaker, turn to rot. Will you dance with me, little tree. 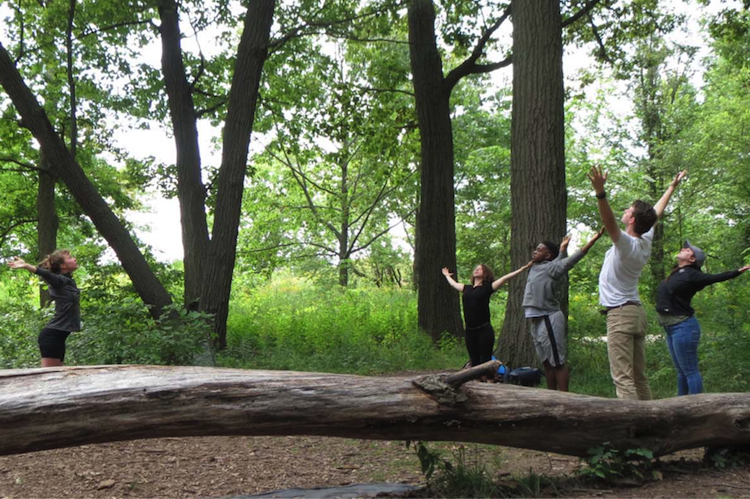 This wasn’t a scene from some Disney musical; it was fieldwork session #3 of the Performance Ecology Project, an experiment to see how somatic practices can help us experience living nature in a more meaningful way than our abstracted modern lives normally afford us. To say it simply: we were seeking encounters with non-human life forms on the common ground we share with all life—that of embodied, emotive experience. The hypothesis was that since somatic exercises tend to slow us down and direct our attention to things that we typically don’t notice, they could become the basis for powerful ecological practices. (You can find a short investigation of this idea here). 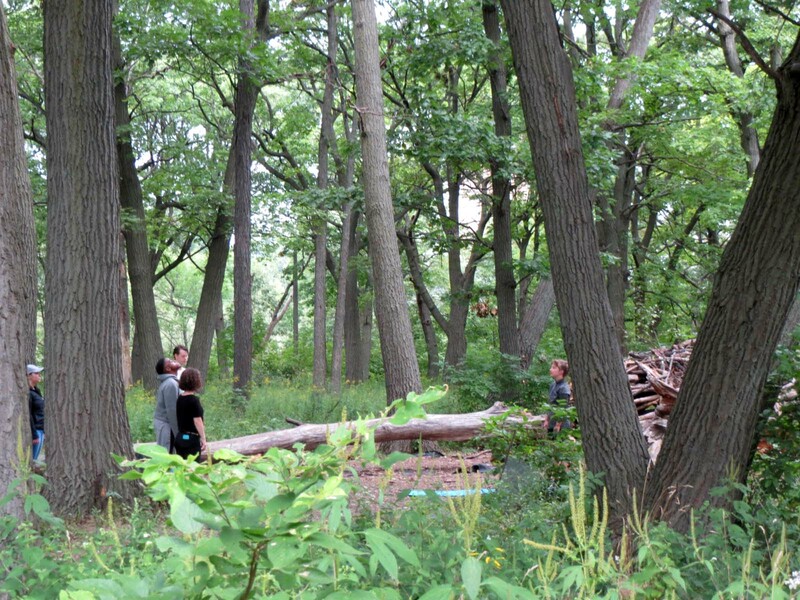 Over five weekend mornings, six performing artists—a dancer, a musician, three actors, and a poet—gathered at the Rotary Centennial Arboretum, an “urban wildspace” in the heart of Milwaukee’s East Side, adjacent to the Urban Ecology Center’s Riverside Branch. 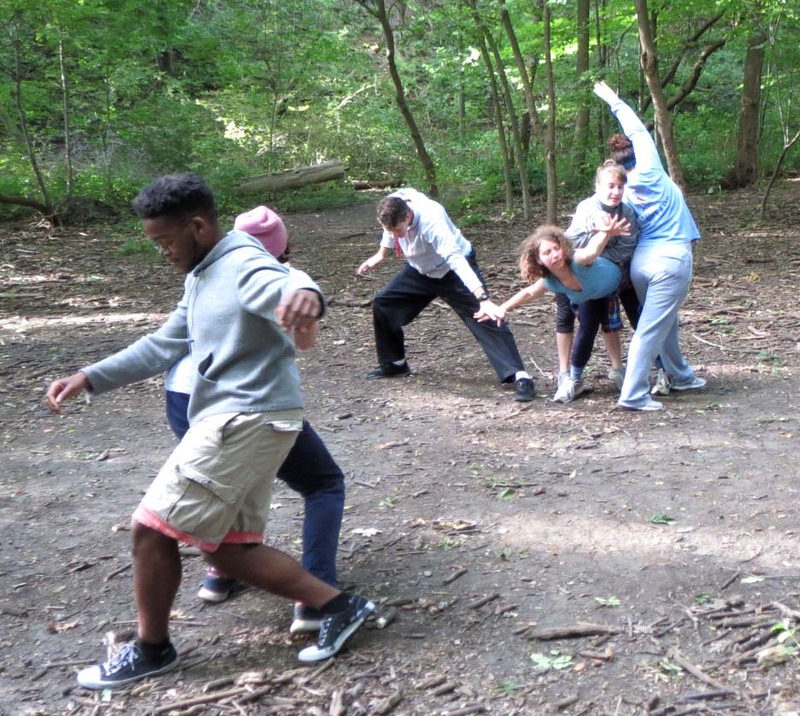 Each week a different teacher would lead them in a different somatic practice (yoga, mindfulness, dance improvisation, tai chi, and theater games), after which the participants would venture into the woods for solo explorations, to encounter and interact with whatever nonhuman life might cross their path. After an hour, summoned back together by the resonant blast of a cow’s horn trumpet, each would present a two-minute performance “report” based on their experience. These, together with their field journals, would provide the material for a devised performance to be presented to the public. If this being could speak, what would it say? Segmented millipedes seemed to love our yoga mats on this cool, overcast morning. Instructor Sarah Arends Haggith led the group in a very precise introduction to Iyengar Yoga. (Haggith later told me that by experiencing how the parts of our body are intimately interconnected, we can recognize the interconnectedness of the natural world.) A light rain began to patter in the leafy canopy about halfway through the hour-long exploration period, but that didn’t faze our intrepid “eco-nauts.” By the time we gathered to give our reports, the rain had become a shower. 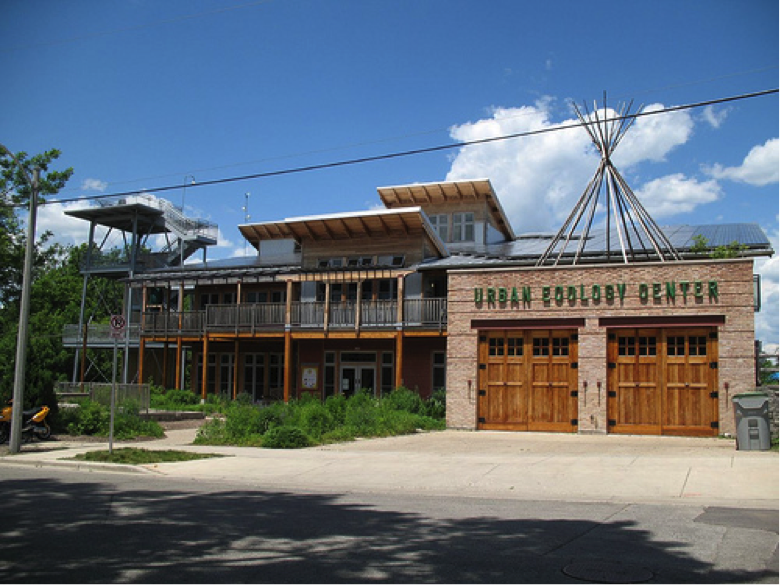 We took refuge under the eaves of the Urban Ecology Center, where we were graced by an elegant spider dropping down in our midst, and a handsome frog observing from the side. Actress Sara Best reported that, having no success trying to “connect” with bees, a frog, sleepy flowers, and a surly spider, she had effortlessly connected with the rain “like an old friend.” Actor/musician Ben Yela gave an impression of a daddy longlegs ecstatically pouncing on a “miniscule neon green” bug. His re-enactment of the “clowniest insect moment I’ve ever seen,” all gangly knees and elbows, was a tiny comic masterpiece. 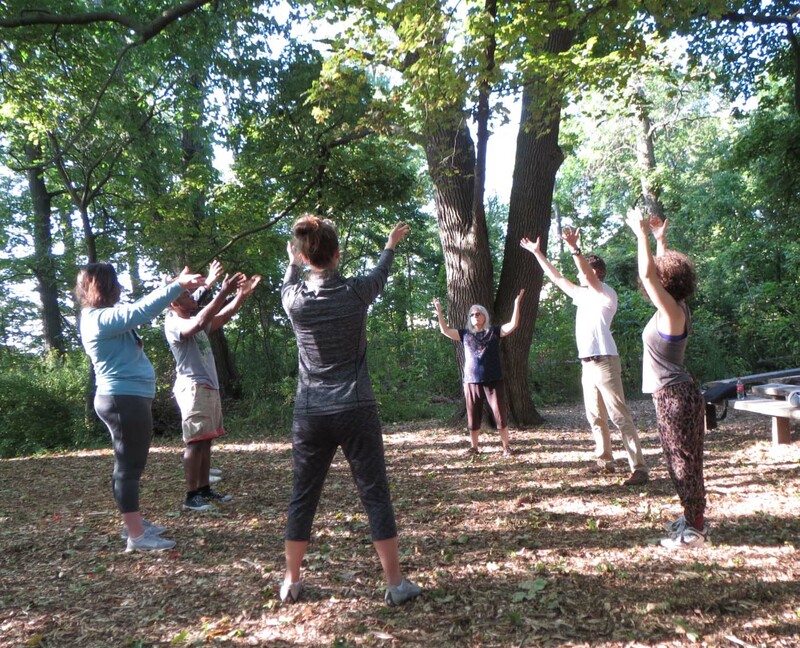 We waved away mosquitoes while Paul Norton of the Milwaukee Mindfulness Center (affiliated with the renowned Vietnamese Zen teacher Thich Nhat Hanh) introduced the principles of mindfulness. Our busy minds, he said, constantly create stories of anxiety and fear, that keep us from experiencing the present moment. The breath, he said, is an ideal vehicle to bring together our minds and our bodies. Casual hikers were out in force on this gorgeous September morning, challenging the explorers’ meditative focus. “You OK dude?” one concerned pedestrian asked actor JJ Gatesman, who was attempting a slow mindful walk. Actress Hesper Juhnke felt obliged to stop and smile at all the people she encountered. Nevertheless, she was able to deliver an exquisitely detailed description of a tiny insect she had encountered hovering right at eye level. Sara created a kind of sensory ritual with various organic treasures she had collected, presenting them to the group, one by one, to see, hear, feel and smell. Debra Loewen, Milwaukee’s premiere guru of site-specific dance, led a spirited class in movement. She began by opening the group to diverse sense experiences, moving with five things they could see, four things they could hear, three things they could touch, two things they could smell, and one thing they could taste. She also offered us an intriguing set of tools for looking at nature: elements of design created by visionary architect Christopher Alexander. By this time we were getting to know the land better. I introduced the idea of “interviewing”: spending time with another living being, observing how it expresses its particular embodied style, looking into it, letting it look into you—an open-ended invitation to communication. JJ bonded with a white butterfly, and ran into similar ones later in the hour. “I felt it was my friend revisiting me,” he wrote in his journal. “At least I’d like to think so.” Dancer Jessi Miller did a satirical pantomime about a road builder frustrated by a tree in her path. This was the day that Hesper performed her little tree song, which, with the sunlight glittering the tree’s leaves and her auburn hair, created, as Jessi put it, a “Disney princess” moment. Do you feel it rustle through your hair — I mean, leaves? Feeling means inwardness, and it is this dimension that we share with other sentient beings, if only to a very small degree. Certainly the inwardness of many life forms is not very similar to human self-awareness and emotions, and to our sense of success and loss, grief and triumph. We cannot know the degree to which we share these emotions with other beings. But we do know that we share the same trembling for our existence, its future, its unfolding, its flourishing. These are feelings that any autonomous living creature experiences. Brian Rott, Artistic Director of the Quasimondo Physical Theatre, led the group on an energetic journey. He had them run while speaking in a stream of consciousness monolog, unexpectedly freezing and listening, in order to experience the contrast. They moved as a group with their eyes closed, relying only on their other senses. Finally they became a pack of predators, stalking an unsuspecting quarry—me! I had the feeling something was going on when everything went quiet; still it was a bit of a thrill to be hunted. The reports featured impressions of bees, a squirrel, and an inquisitive chipmunk. Sara did a lovely meditation on life and death, with milkweed silk in one hand and campfire ash in the other. Our collective attention was turning towards our public performance, just a few weeks away. The performance itself was a roaring success, thanks to the good hearts and talents of all concerned (you can read about it here if you’re curious). There is a feeling that city folk starve for, that I find outside. Not that it make my heart lighter. More that I become more able to bear the heaviness of my heart. It’s very interesting and I think worthwhile to be reminded of these complex feelings as we work to steer our culture in a more ecological direction. Relations with our nonhuman neighbors might be just as tricky as the human kind. Gary Snyder writes: “Performance is currency in the deep world’s gift economy.” This project was a baby step towards a time when we humans can be so brave, so big-hearted, that we could develop practices that enact, in the aesthetic, embodied language of nature, our unrepayable debt to the living world. When we can pass such practices on to our children, we will have created a truly ecological culture. Incidentally, when Hesper finished her song to the little tree, a breeze picked up and the tree’s branches swayed and bowed ever so slightly—as if the tree had accepted her invitation to dance.